Crosslinks enables people to take part in God's mission to bring salvation to the ends of the earth. We do this by encouraging every Christian to get involved. Whoever you are and wherever you're from, Crosslinks can help you play your part in God's plan for the world. We want to help you and your church get involved in God’s plan for the world. Whether it’s speaking at a Sunday service, running a session on mission for church leaders, or setting up a gospel partnership between you and a mission partner, we’re here to help! Ever wondered what you should be praying for your mission partner? We’ve put together a list of ideas. 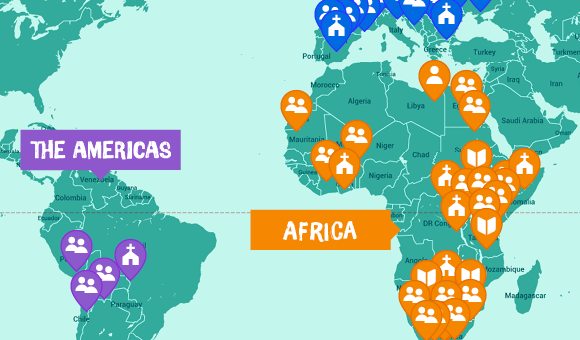 See where Crosslinks has mission partners all across the world. Your details will be used to send you regular newsletters. You can unsubscribe at any time.